With summer well and truly in our rearview mirror, we’re embracing autumn and all it has to offer. Our oversized jumpers and thick padded socks are coming out and with it our cravings for delicious comfort food. You know, those hearty meals that remind us of home and give us the same vibes as a warm embrace. Some of us turn to sweetness, others savoury, but whatever tickles your taste buds, I’ve put together a mixture of popular dishes that so many of us would call ‘comforting’ – all with a vegan makeover, of course! Now I get why the three bears loved having porridge; it’s super delicious, and nutritious, too! And nothing beats a warm bowl of creamy oats when it’s cold outside. And you can always reinvent your oats by changing the toppings, but I think this poached pear recipe is a winner. Oh my, who doesn’t love a delicious stack of pancakes? Often when making pancakes without eggs they can be a little flat, but this fab vegan recipe will put the fluff back into them. Toasted bread oozing with gooey vegan cheese? Yes, please! And if you’re looking to try a new grilled cheese recipe, the pickled jalapeño slices add a fab crunch and spice. If you’re looking for a healthier and fresh way to make lasagne, give this butternut squash recipe a try. It’s creamy and dreamy and there’s even a vegan bechamel sauce to make it super gooey – yum! Pizza, wine and Netflix sounds like weekend bliss to me. I mean, pizza is the ultimate comfort food! 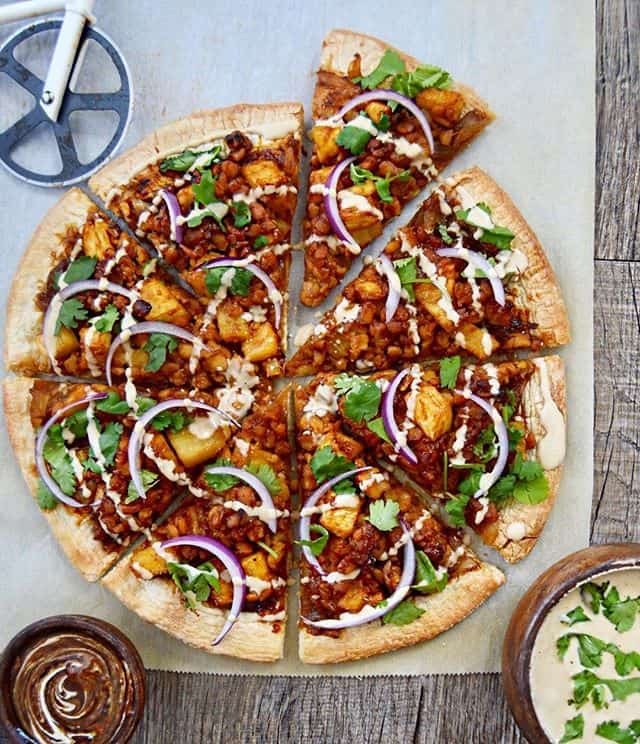 And you won’t need the takeaway menu thanks to this BBQ pizza recipe. And for those who say pineapple doesn’t belong on pizza – well, try a slice of this and get back to me. Bread and (vegan) cheese are two of my favourite comfort foods, so this recipe is pretty much perfect. It’s hot, crunchy, creamy and SO tasty. 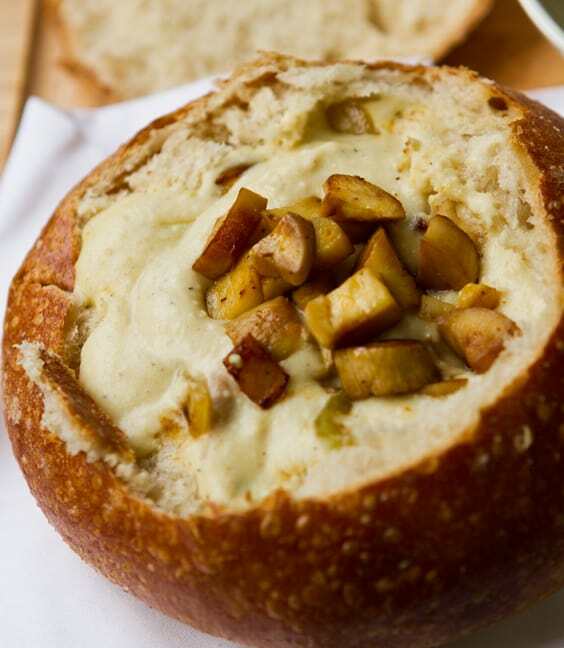 The combination of bread, cheese and garlic….need I say more? As a child, as soon as it got cold enough for a jumper I was enjoying big bowls of warm soup with a crusty roll. My go-to bowl? Tomato! You just can’t beat it. And if you’re looking for more delicious soup recipes to make from scratch check out these vegan soup recipes ahead of fall. 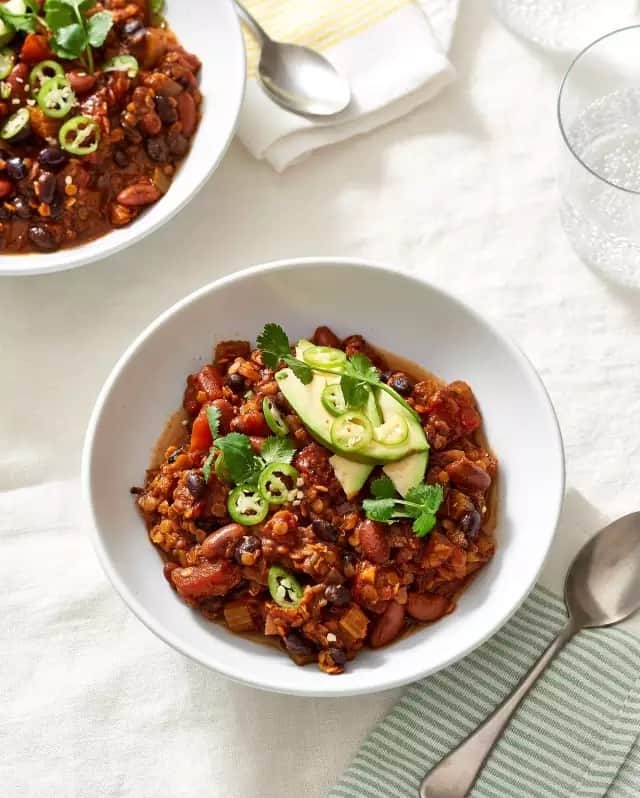 What’s not to love about Chili? You can eat it alone, eat it with rice or throw it on top of some baked potatoes. It’s even more delicious the next day, and if you’ve made too much, it’s easy to freeze for later. You can cook this is a one pot – perfect if you don’t fancy being stuck in the kitchen. I love potatoes in all their glorious forms, but loaded fries have to be one of the tastiest ways to eat them. These baked babies are topped with mushrooms, cheese, pickled jalapeños and BBQ sauce…anyone else drooling?? Love spuds but want lower carbs? Believe it or not, sweet potatoes have a lower GI than the usual kind. They’re also packed with more fibre and vitamins, and here in this recipe, they provide the perfect creamy companion to some spicy chili. What’s more comforting than this creamy mushroom dish? Perfect for the colder months, this feels both filling and fancy. Plus it only takes 25 minutes to make – perfect! Who needs ground beef when you can pack a pie with garlic-infused lentils? They’re peppered with sliced veggies and topped with creamy mashed potatoes, providing a balanced meal in a single dish! Cheesy, creamy hot potatoes? Not diet food, for sure. But when you’re cold or blue, this dish warms the tummy – and the heart! It’s also pretty easy to make and acts as a wonderful side dish to any meal. This pasta is cooked in a creamy tomato sauce and topped with lots of vegan cheese – need I say more? If you’re wondering how the sauce is made so creamy without dairy, the answer is cashews, my friends. For some of us a curry is the ultimate comfort, so keep your curry fresh and exciting with this fruity recipe. The puréed mango is the perfect delicate sweetness against the ginger and earthy spices. 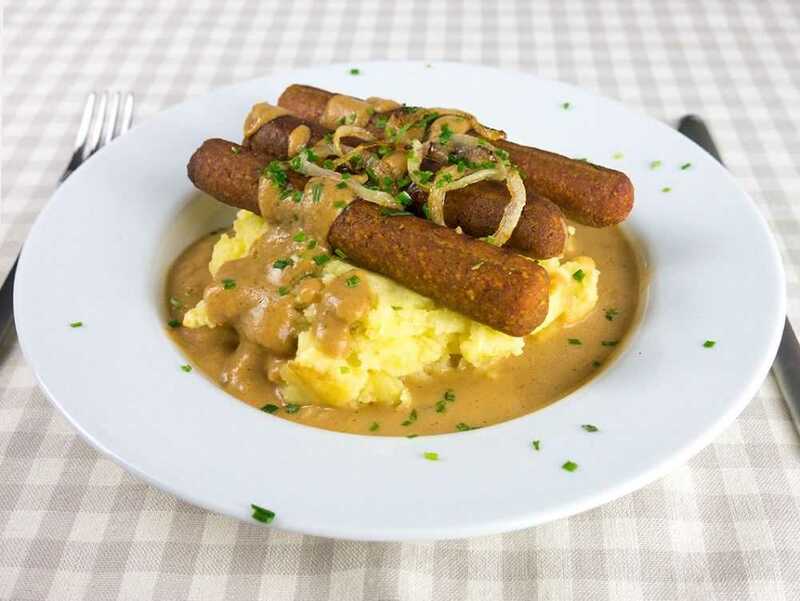 Hearty and meaty vegan sausages meet fluffy mashed potatoes, onions piping hot gravy – seriously, this feels like it not only fills up your belly, but your soul, too! Now you can enjoy McDonalds (minus the cruelty and pollution) thanks to this veganised version of the popular fast food dish. PS: if like me you’re a fan of meaty vegan burgers, why not check out these other totally yum burger recipes? Katsu curry is a popular Japanese dish loved by many, and if you’ve been looking for a vegan version then you HAVE to try this recipe made using tofu. Crunchy on the outside, creamy on the inside, topped with a spicy sauce. You’ll never look back! Every Sunday we have pie, potatoes and veg. It’s a weekly tradition! And what’s not to love? It’s warm, it’s wholesome and it’s super comforting! And this leek and mushroom pie has all the winning components of a great dish; golden, flaky pastry with a delicious creamy sauce that oozes out once cut – drool! Mac and cheese is a comfort food that many of us salivate over, but there’s no denying that the dairy version is pretty much a heart attack waiting to happen. This recipe is heaps healthier – yet just as rich and creamy! As anyone with an Eastern European background knows, pierogi are the absolute bomb! Little ravioli-like pillows of dough stuffed with mashed potato and vegan cheese, fried in onions? Oh man, these hit the spot! Fluffy, buttery and comforting – what’s not to love about some good old-fashioned mashed potatoes? This recipe includes some roasted garlic and it’s seriously divine! 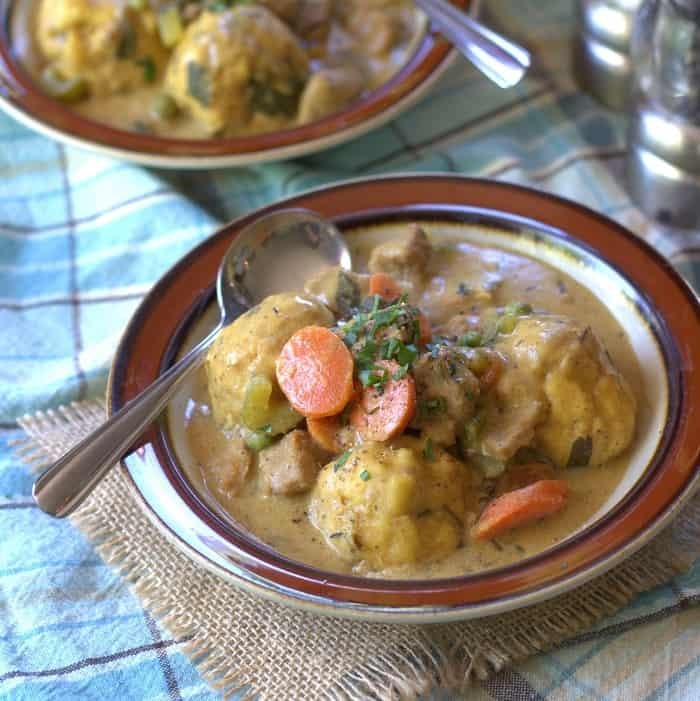 Tender rosemary dumplings, vegan chicken and veggies simmered in a rich, herby broth. A bowl of this feels just like a warm hug! Wonder how you can make cornbread light and fluffy without using dairy? White beans give this recipe a pillowy softness. Top it with some vegan butter or even jam whilst it’s still warm, and enjoy biting into perfection. Enjoy this clam chowder without the clams! It’s super creamy and brimming with smoky flavours. The tender ‘clam’ bites are king oyster mushrooms. All served in a crusty sourdough bread roll. Molten hot chocolate bursts out of a fudgy cake base – it’s a bit like dying and going to chocolate heaven! The best part: this is not only vegan, but gluten free, too. What makes you think of mom’s kitchen more than an apple pie? Warm, tart apples with sweet, buttery pastry – oh yes! Top with some caramel sauce and vegan ice cream and each spoonful will be like a tiny, sweet hug. How many of us have reached for a tub of ice cream when the mean blues strike? I never need an excuse to crack open some ice cream and my go-to flavour? Chocolate, of course! This recipe is made with just 3 ingredients, is quick and cheap – perfect for keeping in the freezer for when you’re feeling a bit down. Chocolate chip cookies coming fresh out of the oven is possibly the smell of most people’s childhood, am I right? Perfect for enjoying with a coffee or with some cold almond milk. Cookies are just the sweetness of life.